Promo period is from November 07 to 16, 2018. The program is open to all active Mabuhay Miles members. *Above rates are quoted per room, per night, exclusive of breakfast. Maximum of 2 persons per room. Extra person charge is Php3,500 to be shouldered by the Member and to be settle at SRC. ** Kids are not allowed in the Deluxe Bay Club. Room Stay package redeemed is non-convertible to cash. A reservation is required 48 hours prior to stay and is subject to availability. This promo cannot be availed in conjunction with any other SRC promotions or discount schemes. Confirmed room reservations are considered as guaranteed bookings. As such, e-vouchers shall be considered used in the event of no shows, cancellations, or rebookings. Redeemed Miles may no longer be credited back to the Member's account. Members may visit the Mabuhay Miles Service Center at Ground Floor Allied Bank Center 6754 Ayala Ave., Makati City, Philippines; or call the Contact Center at (02) 855-8888. Members must provide their Mabuhay Miles membership number, mobile number, and email address upon redemption. A confirmation message (via email) shall be sent by Mabuhay Miles to Members 24 hours after redemption. Starting November 19, 2018, members may call SRC at 888-8888 for room reservations. - Copy of the Beneficiary’s valid government-issued ID or passport. 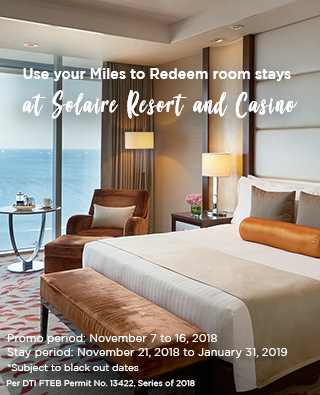 Download the Solaire Vacation Getaway Form here.